This book describes the effects of cold climates on the surface of the earth. Using scientific principles, the authors describe the evolution of ground thermal conditions and the origin of natural features such as frost heave, solifluction, slope instabilities, patterned ground, pingos and ice wedges. The thermodynamic conditions accompanying the freezing of water in porous materials are examined and their fundamental role in the ice segregation and frost heave processes is demonstrated in a clear and simple manner. 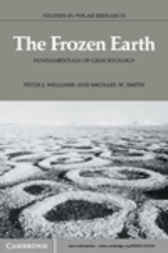 This book concentrates on the analysis of the causes and effects of frozen ground phenomena, rather than on the description of the natural features characteristic of freezing or thawing ground. Its scientific approach provides a basis for geotechnical analyses such as those essential to resource development.